In election years, the Connecticut League of Conservation Voters (CTLCV) surveys candidates for state office about their positions on pressing environmental issues. Those surveys become part of CTLCV’s candidate endorsement analysis. CTLCV’s 2010 Candidate Survey focused on 19 different environmental initiatives likely to emerge in the 2011 legislative session. The survey described those issues generally and did not propose specific legislative language. CTLCV asked candidates to state specifically whether they would lead on, support, or oppose those initiatives. Candidates were also asked to prioritize among those 19 environmental issues or to indicate another priority if it was not listed. For each issue, CTLCV assembled background information on its website for candidates to review if they so chose. ​Seventy-five percent (62) of the survey respondents were candidates for House seats and 25% (20) were candidates for Senate seats. CTLCV’s survey identified distinct priorities among the candidates who responded. The top two issues, energy and transportation, account for 52% percent of the candidates’ priorities. The top four issues combined account for a full 73% of the candidates’ priorities. 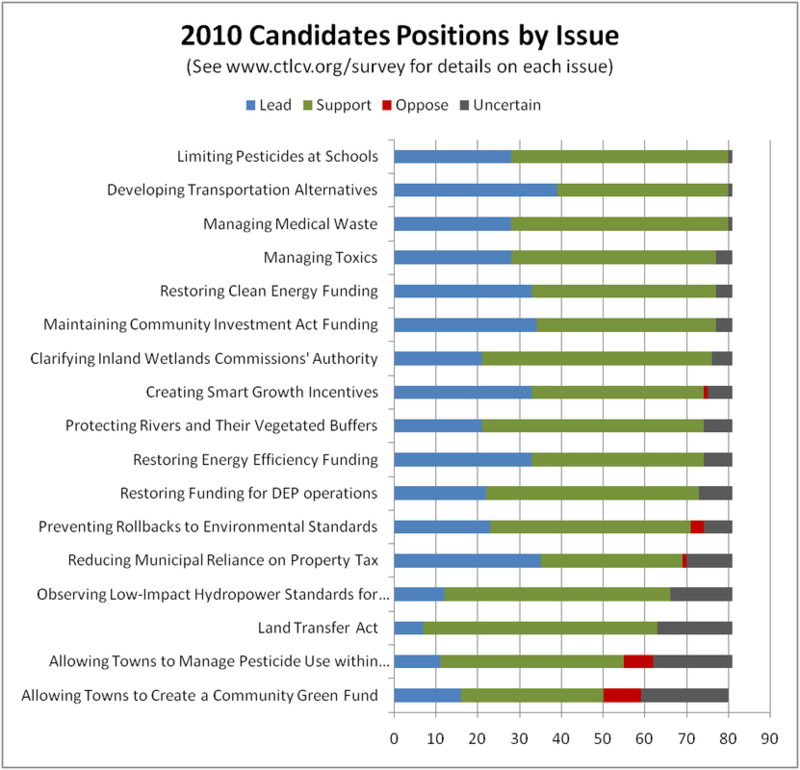 Energy and transportation were also the top two priorities among respondents to CTLCV’s 2008 candidate survey. CTLCV acknowledges that the number of survey responses, especially from Republicans, may distort the conclusions drawn from the data. Nevertheless, as shown below, Democrats far outnumber Republicans in their support for energy and energy funding as a top environmental priority. This focus on energy may reflect frustration with the fate of the 2010 energy bill, SB 493 (which the legislature passed but the Governor vetoed), frustration with Connecticut’s high electricity prices, and concern with climate change. Republicans and Democrats equally support transportation and mass transit as a top environmental priority, perhaps reflecting frustration with highway traffic, high gas prices, and a dearth of feasible alternatives to driving. If the candidates’ priorities reflect those of the electorate generally, we can expect to see significant legislative activity on energy and transportation policy in 2011. Additionally, CTLCV analyzed candidates’ responses about the positions they would take on each of the specific environmental issues in our survey. Managing the disposal of medical waste. Requiring environmental impact evaluations for proposed transfers of state land, in furtherance of the State's conservation and development goals. In addition to polling candidates on their support for these 17 issues, CTLCV asked open-ended questions on candidates’ positions on: 1) strengthening Connecticut’s energy policy and 2) nuclear energy. Those responses are not quantified, but can be viewed online at www.ctlcv.org/survey.htm. We invite the environmental community to use this data to analyze the likely degree of support for various environmental initiatives, determine the need for more education as we work together to protect and preserve the environment while we dig our way out of our current economic downturn.